Initially based in Auckland, now departed for Britain, this catamaran design was requested for fast coastal cruising and racing with ability to go offshore. To increase safety for the latter, water ballast tanks were fitted. 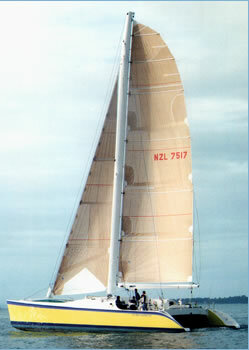 The wing masted rig produced a very powerful boat. The hydraulic rudder systems were designed to retract, creating a very shallow draft catamaran, easy for beaching, cleaning and general maintenance.